"I don't like to fly" she exclaimed. "Well, the good news is that you don't have to fly because I am the one who is going on the trip", I replied. The time came and as we stood in the airport waiting for me to board the plane a familiar statement rang in my ears. 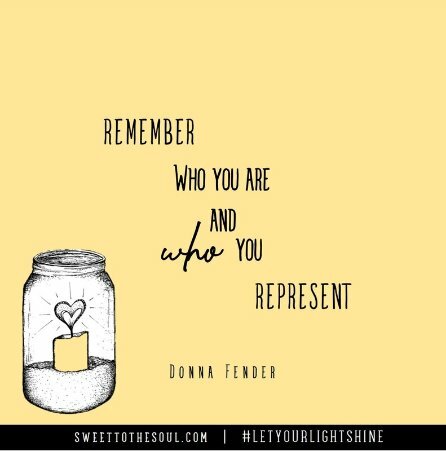 "Remember who you are and Who you represent." Who do we represent? What a loaded question. I grew up in church, singing all the Bible songs and being told that there was a God who was real and would take care of all my needs. I learned when I was young that I had a light inside of me that was there to shine for the whole world to see. 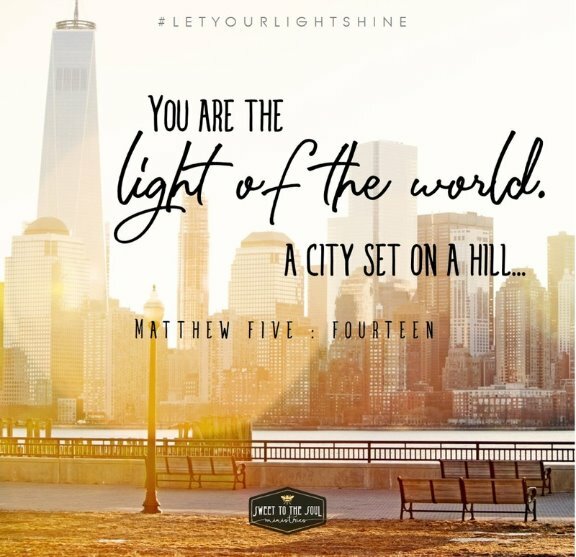 But if you are reading this, you may not have a clue what shining a light means....especially when it means that you are shining it for Jesus. So, what does shining a light mean? We must first understand who the Light is. In John 8:12 we read, "Jesus spoke to them saying 'I am the Light of the world. Whoever follows me will not walk in darkness, but will have the light of life." (ESV). Jesus is the Light. Jesus gives us life and when we accept His offer to follow Him, we have His light in us to share for all to see. When we make the choice to decline His offer, we continue to live in darkness and are lost. In other words, we have something missing and will continue to look around in every aspect of our lives to fill the void....with no success, I might add. So, until we follow Jesus and accept His free gift of life everlasting, we cannot shine His light. God chases us and graces us with Himself and we could not ask for anything more. when we decide to be a Jesus follower we can then learn from our focus verses how to shine for Him. Basically, we become a reflection of the One who brings light to our life. We need to stand high, not being ashamed of the light we have been given. When others ask why we shine, we are able to share that it is because Jesus lives in us. With Jesus, we become a reflection of Him. Living in Jesus offer true freedom and we become a reflection of His love and perfection. · The brightness of His Light or the absence of His light. · Do you follow the world or do you follow Jesus? We have a choice and we can choose to represent the Light or the dark. Choosing to follow Jesus is not as complicated as we think. We must simply believe and accept His invitation. Read the following verses to learn what Jesus has done for you and me! 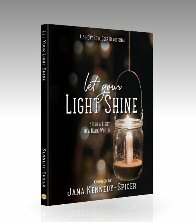 ​Dear Lord, I pray for each woman who will receive and read this devotion on Light. Lord, thank you for shining so bright in a dark, dark world so that we may have hope. Lord, help us to understand that even in our brokenness that we can still shine Your light but if we do not know you, we are trapped in a life of darkness. Lord, I pray that we accept your invitation and choose You! In Jesus’ name, Amen. 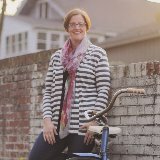 Donna Fender is a daughter of the King, wife to an ordained youth pastor, mother of three beautiful children and a physical therapist. Donna loves to sing and loves to find a song for your favorite verse. This morning as i drove to work i began to cry. I felt that i had let Jesus down had not praised Him in the awful storms in my life.i felt that being overwelmed with so many losses i should have turned to him faced the diasters head on. On My Knees. Now 6 years is approaching quick and this Oct 28 and Nov 12 i will pray harder than ever. Tks for praying along side me.